The Kingdom of Spain is located in southwestern Europe in the Iberian Peninsula. It is bordered by the Atlantic Ocean, the Mediterranean Sea, the Bay of Biscay, Portugal, Gibraltar, Andorra and France. 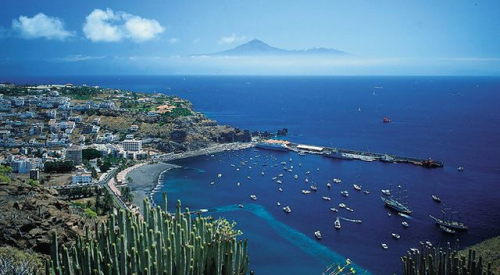 The Spanish territory includes the Canary Islands in the Atlantic Ocean, the Balearic Islands in the Mediterranean, the North African exclaves of Ceuta and Melilla, the Plazas de Soberanía and the town of Llívia which is surrounded by France. Because of its location, Spain was subject to external influences since prehistoric times and through to its dawn as a country. In the early modern period, the voyages of Columbus initiated European exploration and colonization of the American continents, and are thus of great significance in world history. Christopher Columbus was a navigator and an admiral for Castile, a country that along with Aragon later founded modern Spain following the marriage of the Catholic Monarchs and the completion of the Reconquista of the Iberian peninsula in 1492. Spain has been an important source of influence to other regions, chiefly during the modern era, when it became a global empire after that has left a legacy of over 500 million Spanish speakers today, making it the world's second most spoken first language. Spain debuted in Miss World 1960 and reached the Top 3 once in 1961. This year, Aránzazu Estévez Godoy, from the Canary Islands, will represent Spain in Miss World aiming to become Spain's first winner. The Times of Beauty proudly presents Aránzazu Estévez Godoy, Miss España Mundo 2012, in an exclusive interview for our interview series, Meet the Misses. I consider myself a kind, friendly and outgoing person. I like to achieve the goals that I set or at least try to achieve them with effort, determination and dedication. I’m very determined and and humble. My city is characterized by many famous landmarks of cultural and scenic interest. My city has a varied cuisine (being the Flower Cheese of Guía the typical food), besides having pleasant and hospitable people. I live in the neighborhood of Santa Maria de Guía, where people have few economic resources but despite this, the streets are full of children smiling, playing and running around. This is what fill the neighbors with joy. In the future, I would like to concentrate fully on teaching in kindergartens and primary schools (I’m studying this degree right now), but mostly I would like to practice my profession in places where children have few resources to study, whether in other country or in my village, for example, in the school where I studied, because children and their families lack financial resources and there are high rates of school failure due to the family's situations. I’m very proud of being born in my island and have the family and friends that I currently have. I am also very proud of the education I received from my parents because I know they sacrificed daily for my sisters and I have grown with the values of respect, sincerity and love for others that my parents instilled in me throughout my life. I lose track of time when I spend my time doing physical activities and sports like playing basketball, going to the gym, jogging, walking, hiking…but also those activities where I teach basketball to children with disabilities (Down Syndrome). I love going to the beach and read in the field or lying on the beach sun bathing. I think they would define me as a happy person who is always smiling, enjoying every moment of life but also as a shy, sweet and very hard on herself. Something I do is to treat everyone with respect and humility with a smile and empathy, because there is nothing more precious in the world than having respect for others and knowing that a smile opens the way to communication. Teach and give love to a small group of students in my neighborhood's school. I helped them improve in their subjects. I think the worst thing in life is not trying to do things and stay with the feeling of what would have happened if we had tried. I think it’s best to try and do things and if you fail, learn from the mistakes. I think that I would teach the most cherished values of human beings such as respect, love, generosity and sincerity. But if I could teach something to a large group it would be about the unfairness of having millions of children worldwide without basic rights and living in great misery. Children are the future of our society and I would teach people not be selfish and look out for others. Beauty is hard to define, but for me is a whole, it is not just a pretty face or body… Being smart and beautiful is unified with our attitudes. Beauty is different in the eyes of every human being, therefore, the personal attitude that you have each day will be your true beauty. I spent months preparing for this event and I am very excited and happy to represent my country and I know it will be an unforgettable experience. From Spain I appreciate the support that I am getting and I hope see you next August 18th in Ordos, Inner Mongolia, in the finals of Miss World.